With humble beginnings as a choir girl, Sarah won her first solo singing competition at the tender age of 14. Under the informal mentorship of established jazz musicians and musical theatre practitioners in Singapore, Sarah’s love for poetic writing turned into songwriting. Over the last 8 years, Sarah's music has ranged from jazz, fusion, pop and R&B — and is currently on a journey to sing and write songs in Mandarin while expressing her unique blend of musical influences. Sarah Cheng-De Winne's first debut Mandarin album explores "seeing with the heart", a culmination of 5 years of seeing life and music through new eyes since her English debut full-length album, <Brand New>. With a "delightfully soulful" voice, Sarah's musical explorations take the listener on a decidedly heartfelt journey in search of supernatural hope, lighting up the depths of the human heart. The modern R&B ballad "看见 Kan Jian", a key single and titular track, was written to reflect her experiences in participating in three large Chinese singing competitions where she realised that everyone wants to be seen. The definitive "要你的爱 Yao Ni De Ai" explores the emotions of long-distance relationships, while upbeat songs with pop and rock underpinnings such as "12345678910", "阳光磁场 Yang Guang Ci Chang" and "美丽世界 Mei Li Shi Jie" leverage on Sarah's versatility in creating pop hooks that linger. The emotional dedication "爱的恩典 Ai De En Dian" written for her grandmother and faith-inspired "爱形空缺 Ai Xing Kong Que" express Sarah's reflective, yet distinctive R&B-infused tones for the contemporary Chinese audience, balancing fresh musical character with contemporary Mandopop songwriting. Rounding off the album experience are Sarah’s signature performances: rhythmic and soulful songs "超自然盼望 Chao Zi Ran Pan Wang", "斜雨Xie Yu" and "我需要你 Wo Xu Yao Ni" that showcase Sarah's rich velvet timbre — alternating effortlessly between earthy-evocative and the ethereal — and perhaps pointing the direction of future Chinese releases to come from the Singaporean songbird. Let's Pretend was Sarah's debut EP that reflects her jazz beginnings in the Singapore music scene. Then only 22 going on 23 years old, the EP features 7 original songs that explored Sarah's unique blend of soul-pop-jazz with a particular musical theatre edge — not surprising given that it was co-produced by musical theatre composer-arranger, Bang Wenfu. Collaborating with Singapore's top jazz musicians in production, the album features Jordan Wei (Piano), Jimmy Lee (Drums), Aya Sekine (Keyboards), Brandon Wong (Bass), Casey Subramaniam (Bass/Guitars) and Mohd Noor (Percussion). Her first radio single, "Maybe Forever", was picked up by Lush99.5FM and featured Casey Subramaniam on guest vocals. Mixed by Glow at Soundfarm Productions. Sarah’s performance and songwriting on this album was commended for “show(ing) a maturity beyond her years” (TODAY, 9 Sept 2010), with “a good dollop of pop sensibility” (The Business Times, 3 Sept 2010). in 2012, Sarah was mentored by award-winning producer Kavin Hoo to develop her songwriting. despite going through a horrific car accident in july, Brand New (2012) was launched with a ticketed concert at the esplanade recital studio. Delving into lyrical themes of love, redemption and self-empowerment, Brand New features anthemic melodies, foot-tapping grooves and Sarah's signature style of expressive vocal performance set to producer-arranger Kavin Hoo's meticulous music arrangements. The album was lauded for Sarah's vocal and songwriting “versatility…as she tackles R&B, pop and urban rhythms” (TODAY, 12 Oct 2012) within her own “distinctive soulful pop brand” (powerofpop.com, 21 Dec 2012). 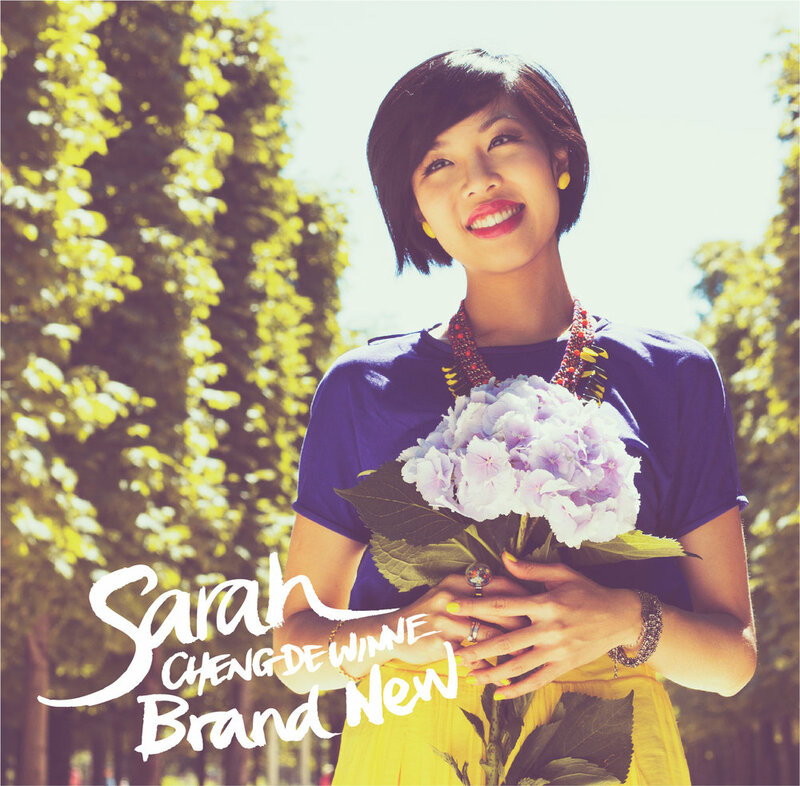 Originally distributed by Warner Music Singapore, Brand New features Sarah's award-winning songs such as "Love-Shape Void" (Winner, US Independent Music Awards 2013, Best Contemporary Gospel/Christian Song), and "Diagonal Rain" (Finalist, US Independent Music Awards 2013, Best R&B/Soul Song). In the UK Songwriting Contest 2012, Sarah was awarded finalist positions (nominated to win) in 4 different categories for her songs “Diagonal Rain”, “Parallel Lives”, “Love-Shape Void” & “Past Midnight (Remix)”. In addition, "Happy Ever After" and "Love-Shape Void" were featured in MediaCorp's first telemovie, "Love...and Other Bad Habits." sarah was then inspired after representing Singapore at Voice China (season 2) to create Chinese versions of a few of her songs, collaborating with award-winning Chinese lyricist, zhang si'er.